Why, because Uncle Walt would be turning one hundred years-old today! A suggestion from Site du Jour of the Day reader Francine Douwes, Forgotten NY explores the history of New York City in a very special way. By paying special attention to those elements of architecture and natural history, advertising and infrastructure that often go ignored by residents add to the charm of visiting a metropolitan area and add to the experience. Francine wrote, "
being a New Yorker, I can't help thinking it very appropriate for the season as well". (011209) HanuKat: Celebrate Hanukkah with the kids. Attempts to turn Chanukah into stories with outrageous content for children to consume continues to amaze. HanuKat: Celebrate Hanukkah with the kids takes the notion an additional step by adding to the stories and elements of the Festival of Lights, which begins tonight. The story of HanuKat and the DreiDells take some getting used to but it's intended for children and it could help explain what tradition dictates. The site has a lot of things for visitors young and old to do and see. The Recipes section in particular stands out and is a nice example of a merchant affiliate account put to good use. (011211) Email Santa Claus Christmas Letters! 10. Kid's letter to north pole comes back stamped, "Dream on, Chester!" 6. Christmas day, your kid wakes up with a Reindeer head in his bed. 3. First words when kid gets on his lap are, "Touch my beard and I'll put the hurt on you." Suggested by Jo-Ann Burton, this section of Aesop's Fables - Online Collection - 655+ fables (http://aesopfables.com/) contains one of the most obscure holiday stories ever written for mass consumption. As Jo-Ann wrote, "I found a very cool site for Christmas. It's called 'The Life and Adventures of Santa Claus'. It's a story written by L. Frank Baum. The complete book is at this URL in chapter format." When Republic Pictures let its copyright on Frank Capra's "It's a Wonderful Life" lapse broadcasters around the world were able to use whatever prints or tape they had free of charge. No royalties needed to be paid on something in the public domain, and in the following years the movie became a classic because of the values presented in the story, the acting, and of course, viewer saturation. The original release of the film was met with mixed reviews -- the message conveyed seemed painfully old-fashioned and after its theatrical run the title was all but forgotten. Recognizing the new status of "It's a Wonderful Life", probably inspired by the Supreme Court ruling in Stewart v. Abend, 495 U.S. 207 (1990) (http://laws.findlaw.com/us/495/207.html), a case in which the copyright protection status of another Jimmy Stewart film, "Rear Window" was decided. Republic acquired the rights to the music in the film and remastered the entire project from the original negatives they still owned. With that taken care of Republic managed to not only set a precedent in the industry, but is seeing the financial benefit of what many assumed to be a lost cause. The film is indeed a classic. Most readers are familiar with the story of George Bailey played by James Stewart but for the one or two people who have never seen what has been considered Capra's Masterpiece, go out and rent or buy it if you can before looking at this site and the pointers it contains. We've all experienced it, walking into the pay-off of a conversation or story. Sorta like a real-life Punchline Theater gone bad. We leave with a small piece of the conversation by our own making so far out of context that we cannot help but think about it for the remainder of the day. We sometimes even tell other people what it was we have heard. It's really not gossip, but it could be. Maybe gossip without purpose or direction, anonymous gossip. --Two guys heading into the stat final ahead of me"
--A woman and a man who almost got a beverage tossed at him, at Peet's coffee"
--A man to a small child hiding in a rack of clothing, at Banana Republic"
Joyeux Noël and Merry Christmas from Site du Jour of the Day! It sure has been a big year. That end of the year festivals and celebrations will carry special meanings for us individually and collectively is almost certain. Enjoy the time you have with those who are close, you never get it back. Thank you for reading Site du Jour of the Day. 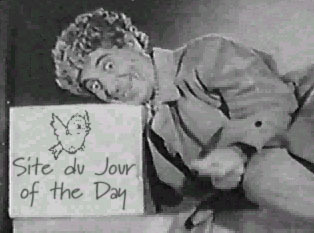 I'm going to take a break through the holidays, with episodes of Site du Jour of the Day starting back just after the first of the year.